GPSSB Recruitment, GPSSB Bharti: Gujarat Panchayat Service Selection Board published recruitment advertisement for various post. Corporation invite young and aspirant candidate, to fill various post mentioned advertisement. The Gujarat Panchayat Service Selection Board released recruitment notification to fill various post. 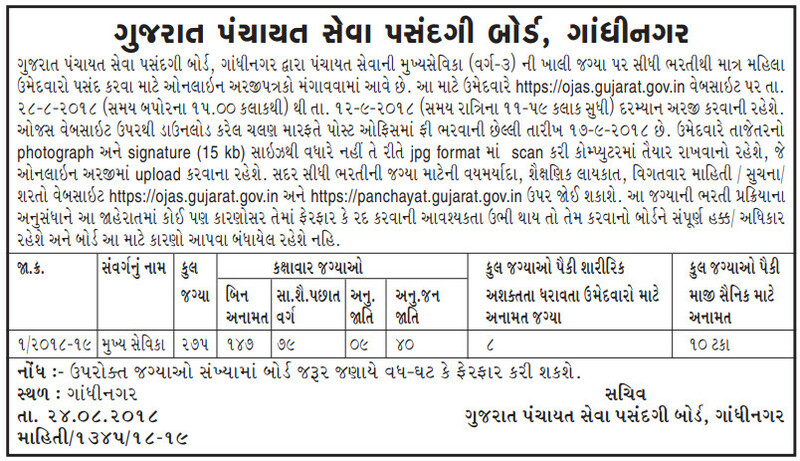 GPSSB published advertisement to invite aspirant candidate. This is a good chance for those candidate who are seeking job in Gujarat Panchayat Service Selection Board. Applicants posses essential qualification they all are eligible for GPSSB Recruitment. GPSSB invite young and aspirant candidate through official website. No other mode of application acceptable. Candidates are advise read all instruction like education qualification, age limit, important date, pay scale, how to apply, exam pattern, selection process and etc on official website. Candidate have to go on official website i.e panchayat.gujarat.gov.in. Click on recruitment and find apply online for selected job. The Applicant should have fill all necessary information like education qualification, personal detail. Candidate should have to upload scanned image of their photograph, signature and relevant certificates as per the process. The full name of GPSSB is Gujarat Panchayat Service Selection Board. This Board Conduct exam for Panchayat department. This board conduct competitive exam for Gujarat Panchayat department. This Board provides career opportunities to those candidates who having essential qualifications and looking for jobs in panchayat sectors. The roa of the this department to provide recruitment in panchayat, make schemes and apply it, get data information nd provide facilities to civilians. Under this board many sub division work. The Gujarat Panchayat Service Selection Board released notification for Mukhya Sevika post. Eligible and aspirant candidate may apply for mentioned post. This is a good chance interested candidate who are seeking job in Gujarat Pachayat Department. Candidate have to apply through online mode on its official website. Eligible candidate may apply online on ojas.gujarat.gov.in from 28th August, 2018 to 12th September, 2018. They may submit fees till 17th September, 2018. Candidates are advise to bookmarks this page and be regular touch on this page for get more latest updates about GPSSB Recruitment 2018.